An immersive experience into the world of communication! Kossmann.dejong designs a new permanent exhibition for the Swiss Museum of Communication, Bern, Switzerland. Developing design prototypes with industry bigwigs that collaborate with School of Design, Istituto Marangoni, Milan, is a portfolio-booster for students studying here. Hands on experience, expert faculty and out-of-box teaching methods command admiration! Devices for Abstraction: a legacy in motion! The use of the 'finger reader' extends beyond the needs of visually impaired, to be used as a translator, merely by a single gesture of touch. The launch of the New School of Design by Istituto Marangoni in Milan on January 23, 2014, expounded the institute’s inherent philosophy that ‘design is infusive and all-pervading’. We invite you to identify the creative in you; develop skills; cultivate new talent! IAnD presents ‘Design Education Special’ in association with Istituto Marangoni. 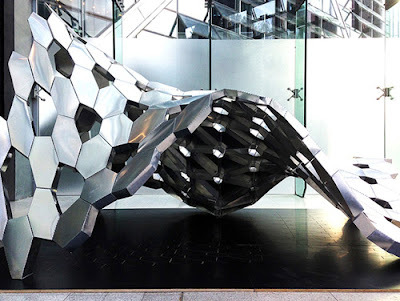 Frsh is a pavilion built by the Architectural Association Beijing Visiting School 2013. Tutored by Rolando Rodriguez-Leal of Aidia Studio and Christoph Klemmt of Orproject, 10 students designed and manufactured the installation within the 9-day course, which was held at Tsinghua University in Beijing.